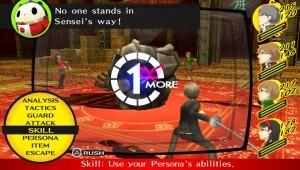 Despite owning every game in the Persona series, I had never gotten around to playing any of them. I can probably chalk this up to obtaining the first two once the original PlayStation was on its decline after the PS2 release. At that point, it seemed like I should try to play the first two before beginning the third one–it being a series, after all. And thus, another part of my game collection was stagnant. 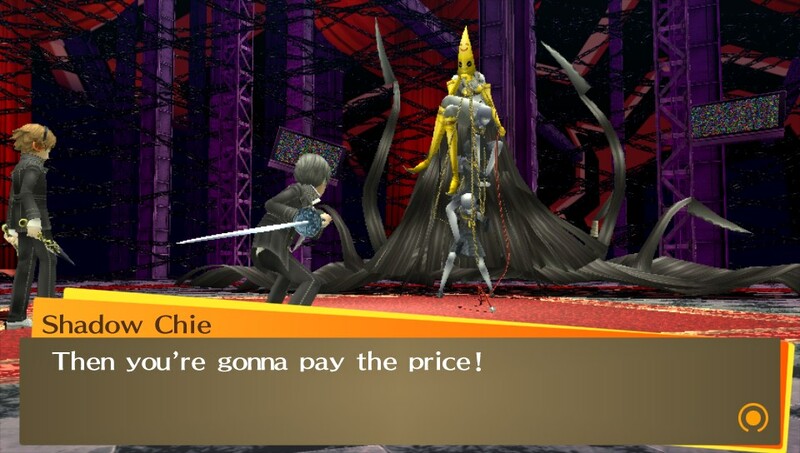 However, in discussing whether or not I should buy a Playstation Vita, a friend suggested to me that Persona 4 Golden was reason enough on its own to buy a Vita. With that kind of recommendation, I had little choice. 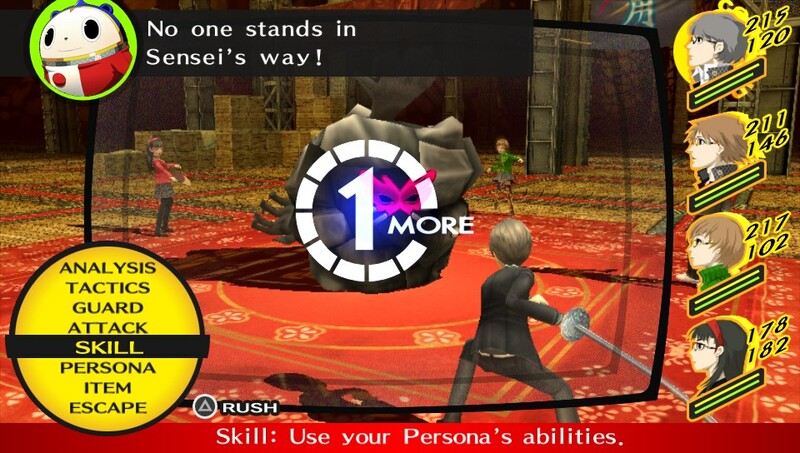 At its core, Persona 4 is a mystery. A small rural town is beset by inexplicable murders not long after our silent protagonist arrives in town. Bodies are left hanging from structures with no obvious cause of death and no clear physical evidence to tie them to anyone. The only clues seem to be that the victims showed up on “The Midnight Channel”–an equally bizarre supernatural occurrence where people appear on deactivated televisions at midnight during heavy rain. 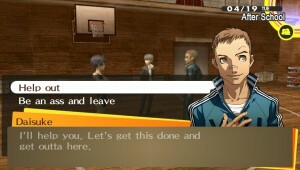 The protagonist gets caught up in situation when he discovers his ability to take himself and others into an alternate world, by going through television screens. Therein we find the split between the two main portions of the game. Outside the TV, the game is a time and relationship management puzzle. The clock is relentlessly advancing as people disappear and need to be saved, if you don’t go into the world of the TV and save them, then it’s game over. At the same time, however, you need to spend time building relationships with other people in the real world so as to make yourself stronger in the TV world and in order to help determine who the true culprit is. The world of the TV, however, is a more traditional JRPG environment. We see turn-based battles à la Final Fantasy, visible enemies on the map, and procedurally generated dungeons. 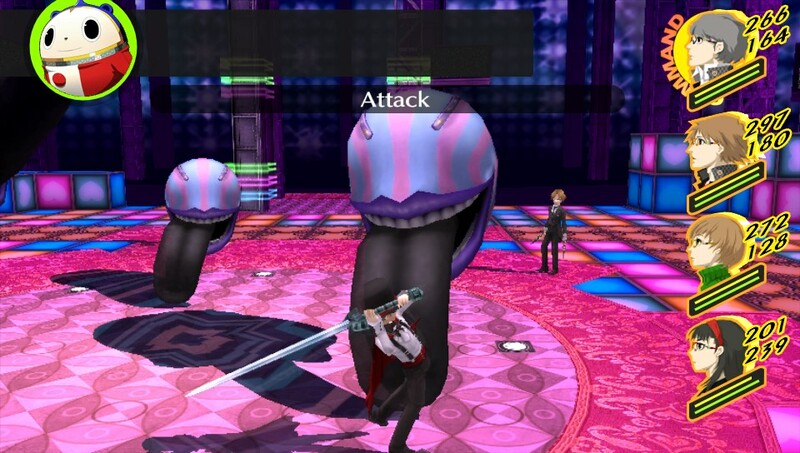 I should stress that while the dungeon crawling and battles will be familiar to any seasoned JRPG player, the battles don’t degenerate into “jam the attack button”. 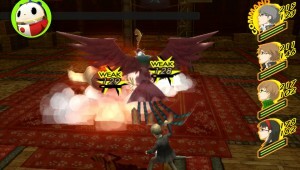 Combat rewards players and enemies for targeting elemental weaknesses with attacks. Hitting a weakness knocks a target down, lowering its defense and giving the attacker another free chance to attack. For the player party this means that they want to target enemy defenses early and often. 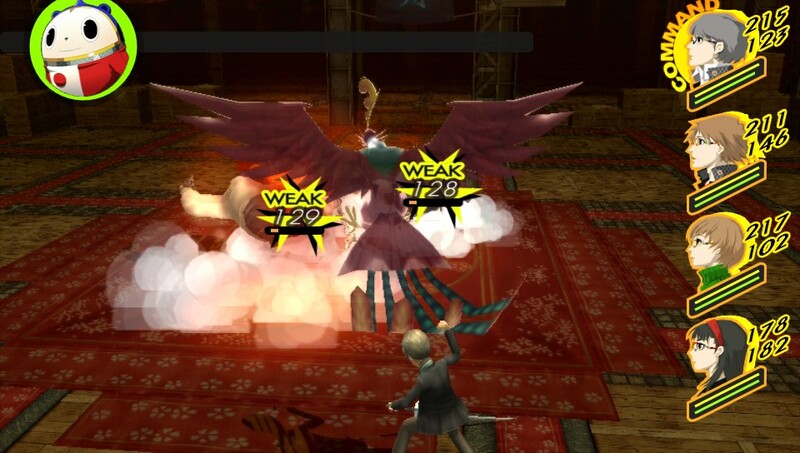 At the same time, though, this system applies equally to player characters, so it is important to mitigate and minimize the chance of elements attacks hitting your own party’s weaknesses. Lest it be assumed that this system is largely ignorable, it is very difficult to become so overpowered that simple physical attacks can carry you through the game (at least on the first playthrough), and being engaged with this dynamic is essential for being successful. Being forced to think and assess enemy make-up and defenses about every single combat made the game feel far more engaging than many JRPGs that I’ve played. 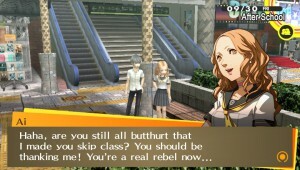 Remember kids, skipping class is fun. 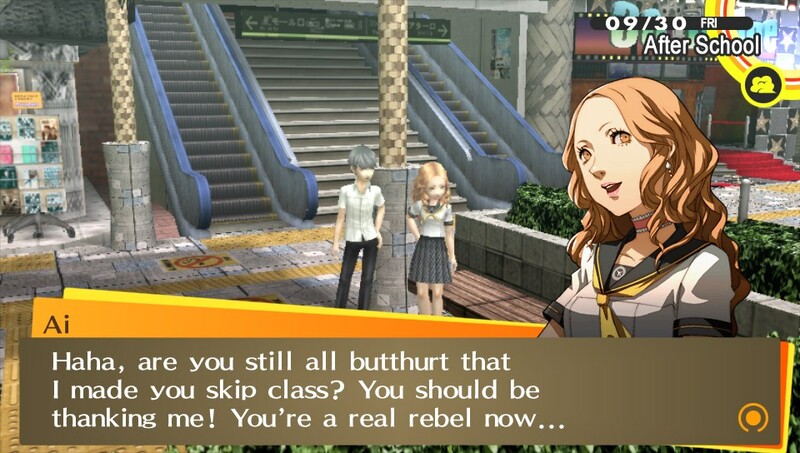 My one complaint about the game it that it is nearly impossible to get the best ending in a first playthrough. There are many things that you can spend time doing–raising social stats, fishing, reading books–and without proper prioritization, it’s impossible to meet the requirements. Subsequent playthroughs make it easier since you can carry over money and social stats and, most importantly, have a good understanding of what needs to be done to succeed. 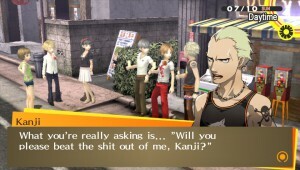 Despite the guide dang it of the best endings, I still think that Persona 4: Golden is worth playing. 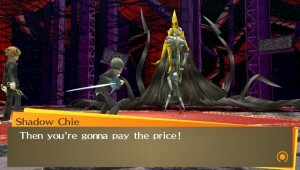 It probably isn’t worth buying a PS Vita for, but if you’re on the fence, it is a solid JRPG. 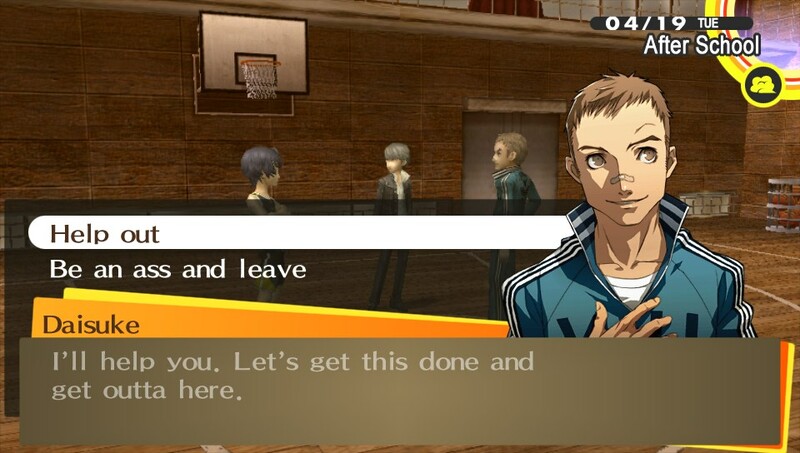 What kind of protagonist would I be if I didn’t have big goals? This entry was posted in Reviews and tagged 1, vita by guyblade. Bookmark the permalink. 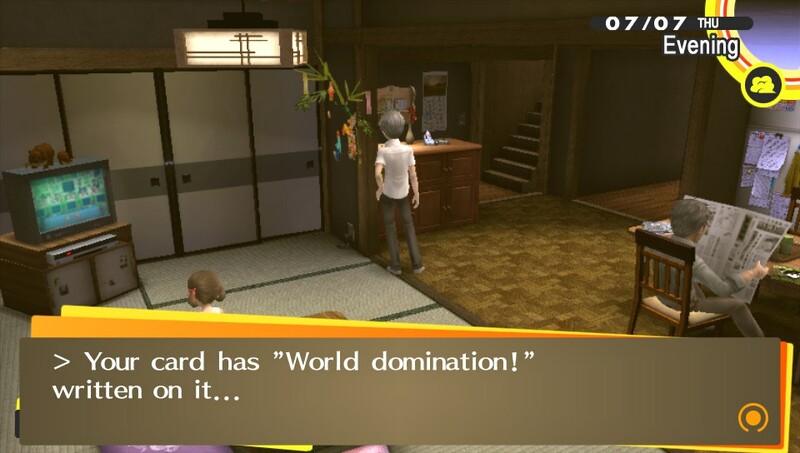 Still sounds better than Persona 1 where the bad ending hangs on one conversation and results in the game ending halfway through. I’m glad that they’ve advanced a bit.